When reviewers got their Nexus 4 review model, they went through all the various pros and one of the only cons of the device was the lack of 4G LTE available on the smartphone. While people in Europe and Asia may not have found this a problem, with LTE only being distributed in a few places around the world, most of the reviewers were from the US and the lack of LTE is a real burden to internet speeds. The Nexus 4 still passes as a great device though, one of the best Google have made. This was all fine, until someone spotted on the benchmarks that the Snapdragon S4 Pro had an LTE port. Android Authority quickly desisted the rumor, saying that the LTE is unusable because it cannot be enabled. However,TechCrunchhave searched through the Nexus 4 and found a way to get LTE to work without any sort of hacking. While other pages have declared it unusable, TechCrunch have checked all the Nexus 4 has and found a way to do it. The problem is that Google never intended this to happen, and Google may patch up the loophole you will find if you click on the TechCrunch link very soon. Other problems with this loophole may be that battery life suffers significantly, as LTE is a battery drainer. Getting the LTE on the Nexus 4 does not require hacking, so if you really want high-speeds at the price of very small battery life and possibly losing it in a week or so, then try it. The brand of LTE is only available for Canadians and T-Mobile 4G tariffs, which are rare. 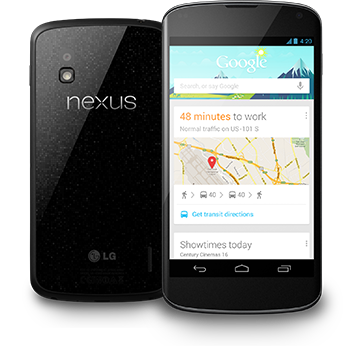 Google have not released a statement on this apparent LTE chip that is not available on the Nexus 4. The reason why LTE may have been unavailable is the price that it would have cost the buyer to get a LTE-unlocked phone.